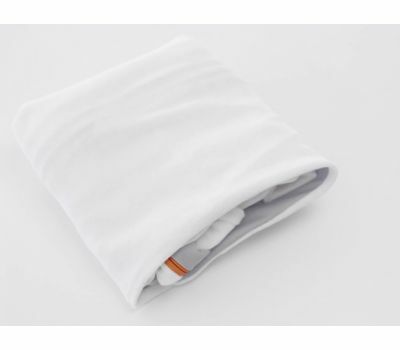 MedCline Reflux Relief System Medium 1304-07 The MedCline Reflux Relief System, our most popular product, includes the Advanced Positioning Wedge and the MedCline Therapeutic Body Pillow for maximum comfort and side-sleeping support. The components work together to comfortably create and maintain the ideal inclined + left-side sleep position for 100% natural reflux relief. Validated in 5 independent clinical trials, the position created only by MedCline has been proven to be the most effective treatment for heartburn, regurgitation, coughing, choking, nausea, and the many other distressing symptoms of acid reflux/GERD, as well as providing protection from prolonged acid exposure...all while you sleep! While the left side is typically best for reflux relief, the Reflux Relief System can be used on the left or right side. Those suffering with shoulder pain only are encouraged to try the NEW MedCline LP Shoulder Relief Solution as only a small amount of elevation is necessary to relieve shoulder pain symptoms. Please keep in mind that the MedCline Reflux Relief System takes up � of a queen-size bed (30� wide). Key features of the MedCline Reflux Relief System include: Clinically proven position for superior relief. Clinical trials performed by the top GI researchers nationwide show that sleeping in the position created only by MedCline (inclined + left side) reduces exposure to harmful stomach acid by 87% compared to a standard bed wedge. MedCline has been clinically proven to provide significant symptom reduction for patients suffering with nocturnal reflux, laryngopharyngeal reflux (LPR) or �silent reflux� patients, post-esophagectomy, and gestational reflux. You won't slide down during the night. The patented design of this dual component system creates the optimal inclined + side sleeping position for reflux relief and prevents you from sliding during the night, which is one of the primary complaints with a standard bed wedge. By not sliding down, you are able to maintain this ideal position for maximum relief, all night long. Sleep comfortably on your side. The patented arm pocket of the Advanced Positioning Wedge not only prevents you from sliding down but it takes the pressure off your downside arm and shoulder. 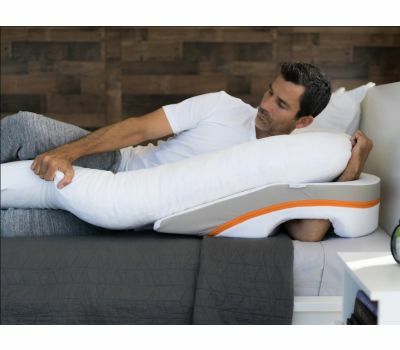 For those who are not naturally side sleepers, the Therapeutic Body Pillow provides additional support to keep you from rolling to your back and can be pulled between the knees to take pressure off your lower back. Inclines your entire torso, not just head and neck. Unlike many standard wedges, the MedCline Reflux Relief System inclines your entire torso, not just your head and neck, for maximum ergonomic support and effectiveness. Medical-grade materials for quality, support and longevity. Most standard bed wedges are just a singular foam cut into a triangle. The Advanced Positioning Wedge is constructed with four types of medical-grade foam, strategically placed for maximum support and product longevity. The top layer of the Advanced Positioning Wedge is memory foam for added comfort. The Therapeutic Body Pillow is filled with high-quality shredded memory foam for adjustability and longevity. Plush removable and washable case installed. Both components of the Reflux Relief System come with removable cases installed, which are machine washable. Relief is guaranteed. Our guarantee is simple. We want to give you ample time to determine if MedCline is going to provide you with the relief you are seeking, so we give you 100 nights to try it out. Should MedCline not work out for you, simply give us a call. We will provide you with a pre-paid return shipping label and upon return, refund your purchase price minus a 10% disposal fee. MedCline is not recommended for lower back or hip injuries. MedCline creates a 15-20 degree angle so those with herniated disks, compounded disks, bulging disks, fused vertebrae, scoliosis, or lumbar damage, arthritic hips, bursitis in the hips, or hip injuries often find it difficult to tolerate the angle that MedCline creates.